Background: Disruption of tight junctions is associated with various inflammatory diseases, including inflammatory bowel syndrome. Tight junctions form a protective barrier throughout the intestinal tract that is central to health. Glyphosate is known to inhibit tight junction function. The aim of this study was to assess the effect of a soil-derived, lignite extract dietary supplement in protecting against glyphosate’s effect on the tight junctions in cell culture. Methods: Small bowel (IEC-6) and colon epithelium (Caco-2) cells were incubated until a stable Transepithelial Electrical Resistance (TEER) was measured. A control and the lignite extract supplement (20% concentration) were placed on the cells and left overnight. These cells were then treated with and without glyphosate at 10 mg/ml. TEER was measured at 30 min. The expression of the tight junctions was determined by immunofluorescent microscopy of the ZO-1 tight junction element before and after overnight incubation, and following glyphosate exposure. Results: TEER increased with the lignite extract on IEC-6 (95%) and Caco-2 (35%) compared to the control. 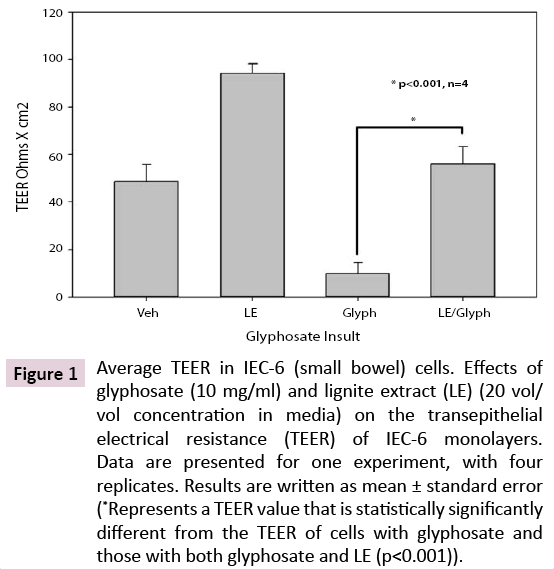 Glyphosate dramatically decreased the TEER in both IEC-6 (80%) and Caco-2 (76%) cells. The lignite extract blocked the glyphosatemediated decrease in TEER. Conclusion: The lignite extract supplement blocked a glyphosate-dependent decrease in TEER in both cell lines. If found efficacious in clinical trials, RESTORE could prove helpful in combating intestinal sensitivities caused by glyphosatemediated tight junction disruption. Intestinal barrier permeability refers to a dysfunction in tight junctions whereby foreign substances (e.g. potential antigens, inorganic compounds, and pathogenic organisms) are allowed unregulated passage from the apical side to the basolateral side of these epithelial cells. Tight junctions are found in all epithelial and endothelial systems such as the nasosinuses, digestive tract, renal tubules, and bloodbrain barrier. These tight junctions serve as firewalls, regulating the absorption of water and macronutrients, and participate in immune system response. Tight junctions are comprised of dozens of proteins that aid in this function, including occludin proteins, the Junctional Adhesion Molecules (JAM) family of proteins, and the claudin family of proteins, all of which span the paracellular space. Occludin proteins are responsible for intercellular signaling within the tight junctions, while the JAM proteins aid in trafficking of immune cells to injured or inflamed tissues . The claudin proteins help determine the permeability properties of epithelial cells, thus controlling the flow of molecules in the intercellular space . Perhaps the most well-known tight junction proteins are the Zonula Occludens (ZO) proteins, which act as scaffolding in the plasma membrane and provide a cytoplasmic structural anchor for the paracellular protein complexes . Tight junctions also serve as a primary barrier or channel through which solutes and ions are selectively transported through the intercellular space. This transport is by passive diffusion, yet is highly regulated, discriminating on three characteristics of the material in transport: electrical conductance, size, and charge selectivity . Tight junctions have also been found to be important in cellular differentiation, proliferation, and communication [4,5]. With tight junctions being critical to proper cellular functioning, knowing how tight junctions are disrupted is important to understanding disease processes such as vascular and neural inflammatory diseases and epithelial cancers (which comprise 90% of all cancers). The disruption of properly functioning tight junctions can occur with exposure to various toxins. The body is exposed to environmental toxins through the air we breathe by inhalation, through contact with skin by absorption, and through ingestion of food and drink. With a clinically significant level of toxins in processed foods, this study focuses on the epithelial tissue of the small and large intestines after toxins are ingested. Gut permeability cause by tight junction dysregulation is increasingly understood to initiate the pathogenesis of a variety of inflammatory diseases, including ulcerative colitis and Crohn’s Disease [6-11]. The inflammatory foundation of these conditions points to the chronic activation of the immune system in the Gastrointestinal-Associated Lymphoid Tissue (GALT) through exposure from tight junction dysregulation. Glyphosate is a nonselective, broad-spectrum herbicide commonly used to kill weeds and grasses that compete with crops, or to kill and desiccate crops prematurely to accelerate harvest. Glyphosate is a glycine amino acid that is chemically modified with a phosphate group resulting in its categorization as an organophosphate. It functions as a competitive inhibitor of 5-Enolpyruvylshikimate-3-Phosphate (EPSP) synthase, an enzyme produced by plants and microorganisms that is necessary for the production of the aromatic amino acids (tryptophan, phenylalanine, and tyrosine) which are necessary constituents of critical plant and human protein structures including hormones and cell membrane components1. With these amino acids inhibited, protein synthesis is arrested, leading to retarded plant growth and eventually death. Glyphosate’s high solubility in water and ability to be absorbed by plants is another reason for its herbicidal efficacy, and its rapid penetration into the ecosystem. Hundreds of millions of pounds of glyphosate are applied on U.S. farms, and more than 1.2 billion pounds are used worldwide each year*. The volume of usage of this herbicide has led to reports of significant levels of glyphosate in water, air, rainfall and even human breast milk†,‡. Healthy soil contains numerous minerals, nutrients and other chemicals released during the bacteria and fungi digestive processes. This is very similar to the human intestinal ecosystem. In both soil and intestinal environments, the chronic use of glyphosate since its debut in 1976 has resulted in suboptimal nutrient availability and delivery to plants and the animals and humans that consume those plants. With the decrement in the nutritional value of our food, clinicians worldwide have begun to turn to fossilized soil (lignite) extracts for mineral supplementation for human nutrition as the nutrient density in the soils decrease due to modern agricultural practices. Shilajit, fulvic acids, and humic acids are naturally-oxidized lignite extracts that have been utilized as mineral supplements in Asia for hundreds of years. Due to their oxidative nature and frequent contamination, their use in the clinical setting has been limited. Significant toxicity introduced from both the mining and the manufacturing of these mineral supplements have been seen in numerous commercial sources [12,13]. RESTORE is the initial lignite-derived mineral supplement in an alkaline liquid form that carries trace minerals and amino acids and that delivers a stabilized family of carbon-based redox molecules as the active ingredient. This study aimed to examine how lignite extract influenced the tight junctions of the intestinal barrier system in the presence and absence of glyphosate, measuring the membrane integrity via Transepithelial Electrical Resistance (TEER) of polarized epithelial membranes of normal small bowel epithelium cells (IEC-6) and colon epithelial cells (Caco-2) [14-16]. Because glyphosate has been determined to cause intestinal permeability, this study examined the protective effects this lignite extract had on the intestinal epithelial cell model systems in combating this common toxic herbicide . Rat ileum epithelial (IEC-6) cell lines and human colorectal carcinoma (Caco-2) cell lines were obtained from the American Type Culture Collection (Manassas, VA, USA; ATCC catalogue CRL-1592 [IEC-6 cells]; ATCC catalog HTB-37 [Caco-2 cells]). Their respective specific media was used to propagate both cell lines according to manufacturer protocols. Glyphosate (Sigma-Aldrich, St. Louis, MO, USA) that was freshly dissolved at a concentration of 10 mg/ml was introduced to the apical membrane and TEER was determined at 30 min. We introduced the cell membranes to the lignite extract supplement (20% concentration) and purified water. RESTORE itself is comprised of the 150 mg of Terrahydrite™ lignite extract at an alkaline pH (over 7.0) and therefore cannot be considered humic acid or fulvic acid. The supplement also contains purified water, as well as a proprietary blend of the following ingredients, comprising less than 1500 ppm: (inorganic compound) chloride, sodium, lithium, calcium, phosphorus, sulfur, bromide, potassium, iron, antimony, zinc, copper, gold, magnesium, (organic compounds) alanine, glycine, histidine, isoleucine, methionine, threonine, and valine. Transepithelial electrical resistance (TEER) is widely accepted as an indicator of tight junction permeability [17-20]. TEER was measured in both IEC-6 and Caco-2 cells seeded in 24- well transwell plates (1-micron pore size, Becton Dickinson). These cells were incubated three days in a row until a stable TEER was determined. TEER was accessed using the epithelial Volt- ohmmeter fitted with a planar electrode (World Precision Instruments, Sarasota, FL, USA). Media with and without the lignite extract or other additives were added to water used to make media from powder (DMEM-F12, Invitrogen, Waltham, MA, USA). These were placed on the cells and incubated at 5% CO2 in a humidified 37°C incubator for the appropriate amount of time. Glyphosate (Sigma-Aldrich, St. Louis, MO, USA), was added to apical media at 10 mg/ml. Measurements were made at the 30-min time point . Directly following TEER measurements, both cell culture systems were simultaneously fixed and permeabilized in 4% paraformaldehyde (Sigma-Aldrich, St. Louis, MO, USA) 1% Triton X100 (Sigma-Aldrich, St. Louis, MO, USA) and incubated for 5 min. Cells were washed and then blocked in two percent bovine serum albumin (BSA) and incubated with one to twenty dilution of cell culture supernatant from Hybridoma clone R26.4c producing anti- ZO-1 monoclonal antibody (Developmental Studies Hybridoma Bank, Iowa City, IA, USA). Alexa 488 labeled donkey anti-mouse IgG (Invitrogen, Waltham, MA, USA) was used at four μg/ml to make the antibody fluorescent. Nuclei were stained with Hoechst five μg/ml. Cells were imaged with a Zeiss (Oberkochen, Germany) Axiovert automated 6D fluorescent microscope and 100 × 1.4 NA plan apochromatic objective. Experiments were performed in four replicates and statistics included herein are results of all four. Data herein are presented as mean values ± the standard error from the mean. P-values were assessed by performing t-tests between groups. Two of the polarized epithelial cell lines, IEC-6 (small bowel) and Caco-2 (large bowel), both formed an electrical resistant barrier on transwell inserts. They were therefore measured for changes in TEER during exposure to glyphosate, lignite extract, and glyphosate and lignite extract together. Glyphosate decreased the TEER in IEC-6 cells by 76%, n=4, p<0.001 (Figure 1) after glyphosate was applied for 30 min (vehicle vs. glyphosate). The lignite extract supplement increased TEER in IEC-6 cells by 93%, n=4, p=0.002 (vehicle vs. lignite). Lignite was shown to prevent the glyphosate-dependent decrease in the TEER on IEC-6 cells when lignite and glyphosate were placed together on the cells, as illustrated by there being no statistically significant difference (p=0.414) between the vehicle and lignite/ glyphosate. Figure 1: Average TEER in IEC-6 (small bowel) cells. Effects of glyphosate (10 mg/ml) and lignite extract (LE) (20 vol/ vol concentration in media) on the transepithelial electrical resistance (TEER) of IEC-6 monolayers. Data are presented for one experiment, with four replicates. Results are written as mean ± standard error (*Represents a TEER value that is statistically significantly different from the TEER of cells with glyphosate and those with both glyphosate and LE (p<0.001)). Glyphosate decreased the TEER in Caco-2 cells by 80%, n=4, p<0.001 (Figure 2) after glyphosate was applied for 30 min (vehicle vs. glyphosate). The lignite extract supplement increased TEER in Caco-2 cells by 35%, n=4, p=0.004 (vehicle vs. lignite). Lignite was shown to prevent the glyphosate-dependent decrease in the TEER on Caco-2 cells when lignite and glyphosate were placed together on the cells, as illustrated by there being no statistically significant difference (p=0.736) between the vehicle and lignite/ glyphosate. Figure 2: Average TEER in Caco-2 (large bowel) cells. 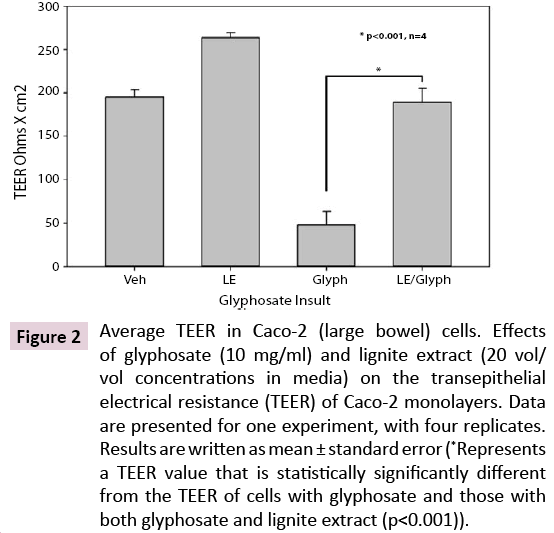 Effects of glyphosate (10 mg/ml) and lignite extract (20 vol/ vol concentrations in media) on the transepithelial electrical resistance (TEER) of Caco-2 monolayers. Data are presented for one experiment, with four replicates. Results are written as mean ± standard error (*Represents a TEER value that is statistically significantly different from the TEER of cells with glyphosate and those with both glyphosate and lignite extract (p<0.001)). The lignite extract’s and glyphosate’s effect on tight junction integrity is seen by examining the ZO-1 of the tight junction by immunofluorescence microscopy in IEC-6 (Figure 3). In the vehicle or control (VEH) cells, the localization of ZO-1 shows interspersed gaps in ZO-1 between the cells (a). As lignite extract and cells were incubated together for only two hours, an increase in abundance of ZO-1 between cells can be seen (b). Glyphosate clearly decreased the consistency of ZO-1 localization between cells (c), and lignite extract prevented this loss of ZO-1 localization between cells (d). The cells were grown and then exposed to Hybridoma clone R26.4c to produce anti-ZO-1 monoclonal antibody. Alexa 488 labeled donkey antimouse IgG was used at 4 μg/ml to make the antibody fluorescent. Nuclei were stained with Hoechst 5 μg/ml. Cells were imaged with a Zeiss (Oberkochen, Germany) Axiovert automated 6 D fluorescent microscope and 100 × 1.4 NA plan apochromatic objective. Images were taken after exposure to (a) glyphosate (10 mg/ml) after 2 min, (b) lignite extract (20% concentration) overnight then glyphosate after 2 min, (c) glyphosate after 10 min, (d) LE then glyphosate after 10 min, (e) glyphosate after 16 min, (f) LE then glyphosate after 16 min. Initially introduced in a 1962 patent, and commercialized in the herbicide Roundup® in 1976, glyphosate is widely used in both industrial agriculture and residential settings. Because of this, it is widespread in our daily environment and food industry. In this study, glyphosate, even at the very low quantities (20 ppm) that would commonly be present in our grocery store foods, rapidly disrupted the intestinal tight junction barrier in both small intestine and colon epithelial membranes. While the exact mechanism for tight junction dysregulation from glyphosate is unknown, it is plausible that it is similar to how gluten disrupts tight junctions through the upregulation of zonulin and the Zonulin Occludins Toxin (ZOT) pathway. Glyphosate’s systemic actions are likely unique due to its small size (molar mass of 169 g/mol) and ability to pass through the plasma membrane, in comparison to gliadin’s relatively large size (>30,000 g/mol). A proposed mechanism by which glyphosate has been shown to decrease TEER in IEC-6 and Caco-2 cells is by dysregulation of tight junctions . Vasiluk et al. have reported glyphosate-mediated disruption of intracellular F-actin fibers resulting in disarrangement of the normal cytoplasmic honeycomb, with nuclei neatly in the middle of the cell, to a more chaotic localization of the nuclei after exposure to the herbicide . We demonstrate this phenomenon again with our IEC-6 data above demonstrating chaotic nuclei distribution following glyphosate exposure (Figure 3). Indeed, one advantage of this experiment methodology is that it provides simplicity with which to determine glyphosate’s impact on tight junctions and lignite’s protective efficacy against this glyphosate-mediated effect. But simplicity comes at a cost. Further research is needed to determine the specific mechanism of how glyphosate leads to tight junction dysregulation. Few research studies have illustrated improvements in tight junction integrity and TEER of polarized epithelial cells. Some natural substances that have shown such improvement include quercetin, butyrate, L-glutamine, and the probiotic Bifidobacterium, and the lignite extract compound studied herein [19,22-32]. Larazotide, a synthetic pharmaceutical and zonulininhibitor, has also shown to improve tight junction formation . Among these reported compounds, lignite extract is seen to more quickly improve tight junction integrity as measured by the TEER functional analysis as seen by immunofluorescence of zonulin protein expression. This improvement in tight junction integrity occurred within the first thirty minutes from introduction. This study demonstrates the capacity of the lignite extract to block glyphosate-mediated injury in small intestinal and colon epithelial membranes, even at glyphosate levels 50 times higher than allowable in foods like corn and soy. The direct effects of lignite extract on large and small bowel tissues evaluated in this study include a rapid increase in tight junction expression, indicating a strengthening of intestinal barrier function. The public health ramifications of these results may be significant as intestinal permeability from tight junction dysregulation continues to be recognized as a foundational cause of chronic inflammatory conditions . Tight junction injury has also been shown to be involved in a variety of seemingly different diseases, from allergies and asthma to Alzheimer’s disease and Parkinson’s disease. The debate continues to be ongoing as to whether the rise in the incidence of these disease is due to an increase in public and practitioner awareness, or due to notable changes in our food system. This study shows how the consumption of food products containing glyphosate may result in intestinal barrier permeability. This permeability can lead to unregulated antigen presentation to the gastrointestinal-associated lymphoid tissue which, in turn, can cause chronic inflammatory conditions in our population. Further studies are needed to assess potential clinical applications of lignite extract supplements. We are grateful to Barbara Brand for her helpful comments on the manuscript. This study, including the experiments, analysis, and publication was funded by Biomic Sciences, LLC (Charlottesville, VA USA). JJG designed and executed the experiments. DAR and ZMB contributed to the data analysis and writing of the manuscript. JJG, DAR and ZMB are shareholders in Restore, a supplement that has been shown to help with intestinal permeability in laboratory cell culture. 1*Mann D. Glyphosate now the most-used agricultural chemical ever. In: News Week. Feb 2, 2016. http://www.newsweek.com/glyphosatenow- most-used-agricultural-chemical-ever-422419. Accessed 14 Aug 2016. † Honeycutt Z. Glyphosate testing full report: Finds in American mothers’ breast milk, urine and water. 2014. http://www.momsacrossamerica. com/glyphosate_testing_results. Accessed 2 Aug 2016. ‡ Rohrich JD. The truth about toxic wheat. In: Huffington Post. 2014. http://www.huffingtonpost.com/jenny-dewey-rohrich/the-truth-abouttoxic- wheat_b_6180498.html. Accessed 14 Aug 2016. Van Itallie CM, Anderson JM (2014) Architecture of tight junctions and principles of molecular composition. Semin Cell DevBiol 36: 157-165. Gunzel D, Yu AS (2013) Claudins and the modulation of tight junction permeability. Physiol Rev 93: 525-569. Bauer H, Zweimueller-Mayer J, Steinbacher P, Lametschwandtner A, Bauer HC (2010) The dual role of zonulaoccludens (ZO) proteins. J Biomed Biotechnol 2010: 402593. Anderson JM, Van Itallie CM (2006) Tight junction channels. In: Gonzalez-Mariscal L(ed.) Tight junctions. NY, USA: Springer. Fromm M, Schulzke JD (2009) Molecular Structure and Function of the Tight Junction: From Basic Mechanisms to Clinical Manifestations. NY, USA: Wiley-Blackwell. Wang W, Uzzau S, Goldblum SE, Fasano A (2000) Human zonulin, a potential modulator of intestinal tight junctions. J Cell Sci24: 4435-4440. Fasano A (2012) Zonulin, regulation of tight junctions, and autoimmune diseases. ‎Ann N Y AcadSci 1258: 25-33. Fasano A (2012) Leaky gut and autoimmune diseases. Clin Rev Allergy Immunol42: 71-78. Fasano A (2008) Physiological, Pathological, and Therapeutic implications of zonulin-mediated intestinal barrier modulation. Am J Pathol173: 1243-1252. Fasano A (2011) Zonulin and its regulation of intestinal barrier function: the biological door to inflammation, autoimmunity and cancer. Physiol Rev 91: 151-175. Samsel A, Seneff S (2013) Glyphosate’s suppression of cytochrome P450 enzymes and amino acid biosynthesis by the gut microbiome: pathways to modern diseases. Entropy 15: 1416-1463. Rudnev MI, Maliuk VI, Stechenko LA (1993) An electron microscopic analysis of the stimulating and toxic effects of mumie-containing preparations. LikSprava 12: 63-64. Saper RB, Phillips RS, Sehgal A, Khouri N, Davis RB, et al. (2008) Lead, mercury, and arsenic in US- and Indian- manufactured Ayurvedic medicines sold via the Internet. JAMA 300: 915-923. Quaroni A, Wands J, Trelstad RL, Isselbacher KJ (1979) Epithelioid cell cultures from rat small intestine. Characterization by morphologic and immunologic criteria. J Cell Biol 80: 248- 265. Rousset M, Chevalier G, Rousset JP, Dussaulx E, Zweibaum A (1979) Presence and cell growth-related variations of glycogen in human colorectal adenocarcinoma cell lines in culture. Cancer Res 39: 531-534. Sääf AM, Halbleib JM, Chen X, Yuen ST, Leung SY, et al. (2007) Parallels between global transcriptional programs of polarizing Caco-2 intestinal epithelial cells in vitro and gene expression programs in normal colon and colon cancer. Mol Biol Cell 18: 4245-4260. Vasiluk L, Pinto, LJ, Moore MM (2005) Oral bioavailability of glyphosate: studies using two intestinal cell lines. Environ Toxicol Chem 24: 153-160. 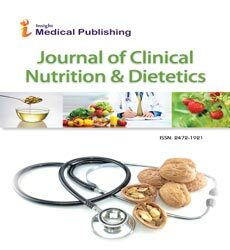 Gildea JJ, Roberts DA, Bush Z (2016) Protection against gluten-mediated tight junction injury with a novel lignite extract supplement. J Nutr Food Sci 6: 547. Ling X, Linglong P, Weixian D, Hong W (2016) Protective effects of Bifidobacterium on intestinal barrier function in LPS-induced enterocyte barrier injury of caco-2 monolayers and in rat NED model. Plos One 11: e0161635. Peng S, Wang SB, Singh D, Zhao PY, Davis K, et al. (2016) Claudin-3 and claudin-19 partially restore native phenotype to ARPE-19 cells via effects on tight junctions and gene expression. Exp Eye Res 151: 179-189. Gildea JJ, Seaton JE, Victor KG, Reyes CM, Bigler Wang D, et al. (2014) Exosomal transfer from human renal proximal tubule cells to distal tubule and collecting duct cells. ClinBiochem 47: 89-94. Shen L, Weber CR, Raleigh DR, Yu D, Turner JT (2011) Tight Junction Pore and Leak Pathways: A Dynamic Duo. Annu Rev Physiol73: 283-309. Suzuki T, Hara H (2009) Quercetin enhances intestinal barrier function through the assembly of zonula occludens-2, occludin, and claudin-1 and the expression of claudin-4 in Caco-2 cells. J Nutr 139: 965-974. Chuenkitiyanon S, Pengsuparp T, Jianmongkol S (2010) Protective effect of quercetin on hydrogen peroxideinduced tight junction disruption. Int J Toxicol 29: 418-424. Amasheh M, Schlichter S, Amasheh S, Mankertz J, Zeitz M, et al. (2008) Quercetin enhances epithelial barrier function and increases claudin-4 expression in Caco-2 cells. J Nutr 138: 1067-1073. Mercado J, Valenzano MC, Jeffers C, Sedlak J, Cugliari MK, et al. (2013) Enhancement of tight junctional barrier function by micronutrients: compound-specific effects on permeability and claudin composition. PLoS One 8: e78775. Peng L, Li ZR, Green RS, Holzman IR, Lin J (2009) Butyrate enhances the intestinal barrier by facilitating tight junction assembly via activation of AMP-activated protein kinase in Caco-2 cell monolayers. J Nutr 139: 1619-1625. McGilligan VE, Wallace JM, Heavey PM, Ridley DL, Rowland IR (2007) The effect of nicotine in vitro on the integrity of tight junctions in Caco-2 cell monolayers. Food Chem Toxicol 45: 1593-1598. Beutheu S, Ghouzali I, Galas L, Déchelotte P, Coëffier M (2013) Glutamine and arginine improve permeability and tight junction protein expression in methotrexate-treated Caco-2 cells. ClinNutr 32: 863-869. Anderson JM, Van Itallie CM (2009) Physiology and Function of the Tight Junction. Cold Spring HarbPerspectBiol 1: a002584. Lerner A, Matthias T (2015) Changes in intestinal tight junction permeability associated with industrial food additives explain the rising incidence of autoimmune disease. Autoimmun Rev 14: 479-489. Turner JT (2009) Intestinal mucosal barrier function in health and disease. Nature Reviews Immunology 9: 799-809. Gopalakrishnan S, Tripathi A, Tamiz AP, Alkan SS, Pandey NB (2012) Larazotide acetate promotes tight junction assembly in epithelial cells. Peptides 35: 95-101. Xavier RJ, Podolsky DK (2007) Unravelling the pathogenesis of inflammatory bowel disease. Nature 448: 427-434.